10 cities, 800 miles, 5 hotels and over 100 properties. All in the name of research and to validate the reality that the numbers we have been crunching are true. When you think of Texas you think of vast open ranch land, cowboy hats and BBQ. Unless you have been paying attention what you don't know is Texas has been using the booming domestic oil industry to fuel growth and diversify their cities. Houston is the 4th largest city in the United States. Let that sink in for a minute that means Houston is bigger than Phoenix, Philadelphia San Francisco, Miami, and Denver with only Los Angeles, Chicago and New York as bigger cities. Houston is a hustling and bustling major city with much of its major new growth pushing north and west. The Woodlands directly north is home to Exxon worldwide headquarters. As we focused most of our research on these new areas, armed with a list of foreclosures for Spring, Tomball, Katy and Cypress, a rental car full of gas we took off to see what these houses and neighborhoods looked like beyond numbers on a spreadsheet and comps on a computer. What we found was a very consistent building product, big houses with brick facades and comp roofs. Nice neighborhood followed up by the next nice neighborhood with each subsequent city getting nicer and the price per foot climbing in each area. But for our purpose we still had plenty of foreclosures to research in every area. After 2 days of working our way further north and west we left from the very new and high end suburb Cypress and headed up the 290 to the capital in Austin. Our initial research into Austin was actually the small new growth cities to the north and east of Austin in Manor, Round Rock and Pflugerville. We found much of the same building products in this area with many of the same national and local builders actively building at break neck pace. In one new subdivision I saw at least 30+ houses under construction at once. Which was an encouraging sign as many of those same builders in markets of California are only building 2-4 at a time and then waiting till they sell to start the next 2-4. Which to me means there is plenty of demand and that the builders know their product is being sold at an equally fast pace. One interesting new DR Horton small lot alley load project in Pflugerville with funky street names like Craters of the moon Blvd had an entire street of unfinished houses with sold signs staked into the mud. The soft and slow new home market of California does not exist in Texas. Now about Austin city proper.... well I’ll actually wait to talk about Austin. San Antonio is the 2nd largest city in Texas with a population of 1.4M. Looking at San Antonio on a map doesn’t do justice to its size as in person it is hard to take in the size of this city. In the last 10 years it has grown by nearly 20% passing Dallas in population size. In San Antonio we were able to meet up with a friend Effraim Varga of Collaborative Homes that has been doing investments in the historical areas of King William and Lavaca over the last 4 years. As we toured the city with an insider we were able to see how much redevelopment is going on in the interior of San Antonio. Yes there are new home builders spreading the footprint of the city further and further but what was really exciting to see was the redevelopment and infill project going on in these downtown and historic areas. As I have looked at more houses than I can count over my career, which would probably be well into the 10s of thousands of properties it was eye opening to check out San Antonio especially the King William area. Huge unique, amazing mansions built along the river in the late 1800s and early 1900s with stunning estate after estate it was quite interesting to see just a couple streets away brand new modern houses being built. Even though we were on a whirlwind tour looking at properties and prepping for the foreclosure auction the next day in San Antonio we were able to check out Effraim’s exciting new infill projects. A 1.1 acre trailer park being re-purposed into a 28 unit modern townhome project and a .6 acre abandoned gas station being redeveloped into a 10 unit high end modern residential project (Check out his project at theparkatlonestar.com). Hitting the morning foreclosure auctions in San Antonio and then heading back to Austin for the afternoon auctions proved to be very exciting and positive day. Now to tell you about Austin itself. Keep Austin weird! The city business slogan written on t-shirts hanging from racks, flags waving from streets and even hotel clerks with the slogan below their name tags. Initially caused me to raise an eyebrow in ire and thinking what is this hippy dippy slogan? Well as we toured the Downtown, East Austin and Caesar Chavez areas of Austin I know exactly what they mean. I have never seen a more colorful eclectic mix of cool and funky houses anywhere in the world. As Austin is the capital of Texas it is one of the oldest cities in the state as such much of the downtown is very old with houses and building dating as far back as the 1800s. However that doesn’t do it justice to say the architecture is older. What is exciting about Austin is that it is the fastest growing city in the US and has a median age of 29.6 years old. This young city is exploding with creative and funky cool modern projects. As we drove the heart of Austin we thought Hey look at that house it is falling down. Wait!? No that house was built to look like that. Interesting! Add onto that the exterior colors of the houses being remodeled literally everywhere in that area. It was as if you spun a wheel of color and whatever it landed on was what color the house was going to be painted. Purple, sunglo yellow, dark grey, lime green, nothing was too bold for Austin. To see ultra modern house right next to a tiny 100 year old house was quite invigorating. Also to boot (Boot, Cowboys, Texas get it) Austin now has a population that is sitting at about 900k which in comparison is now slightly larger than San Francisco. 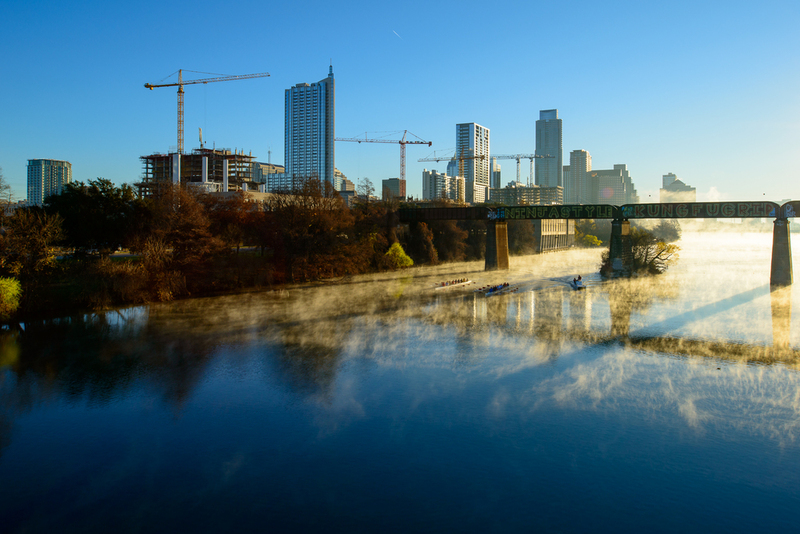 Austin has huge cranes hovering the downtown area along the river as multiple 20, 30 and 40 story high rise buildings are being built to satisfy this blossoming young city. Combine in the fact that Austin is named as the live music capital of the world with more than 100 venues there is a big tourism attraction to the area. With a government embracing growth and combining these factors it is easy to see why it is one of the fastest growing cities in the US. West Austin and up the hills into Lake Travis is not the eclectic mix of real estate but it is very much exciting in its own right. As most of the houses start at 1M which in case you are not familiar is very expensive in Texas. What is interesting is there are several multimillion dollar houses in West Austin with plenty of activity from buyers and sellers. Austin may be weird but it is a young creative and an exciting city with all ends of the spectrum in terms of housing. Overall after visiting 10 cities, logging over 800 miles in a rental car staying in 5 different hotels and checking out over 100 foreclosures in Texas I would say our research homework trip was 100% successful. The numbers we were looking at on paper were very much accurate but also we were even more surprised with the metropolitan growth of Texas. With this migration of population to Texas and the lack of housing it is easy to understand why the real estate market is so very hot in Texas.